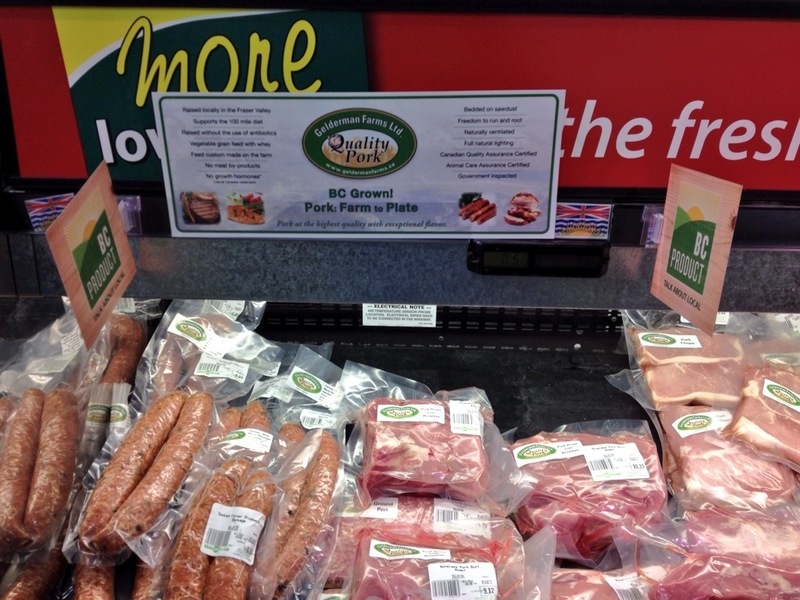 If you have grown up in Vancouver you will be familiar with a popular local chain run by a well known family! I actually was lucky enough to go to high school with one of the Fuller sons so I have always felt an extra connection to this hip chain. 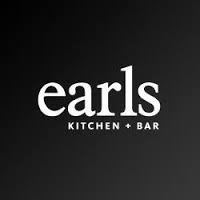 Over the years I would find myself heading to Earls with friends or family for a good night of good food and good times, I can’t ever say it was on the top of my list for brunch but do remember the brunch of old. I was lucky enough to learn about their new brunch menu now only 3 weeks into its launch! 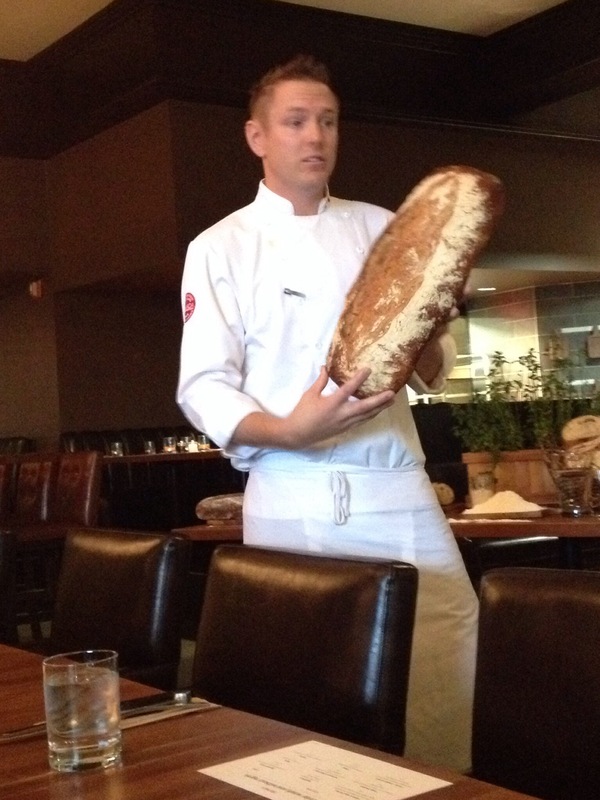 The menu focuses on their House made Sourdough bread that they have been working on perfecting for over two years! They have hit the mark and created a wonderful, rustic house made fresh sourdough which is one of the Stars in this new flavourful brunch. The new menu has something for everyone. A truly heart and tummy warming surprise is a little treat that all brunch guests are presented with as you get ready for your brunch experience…. 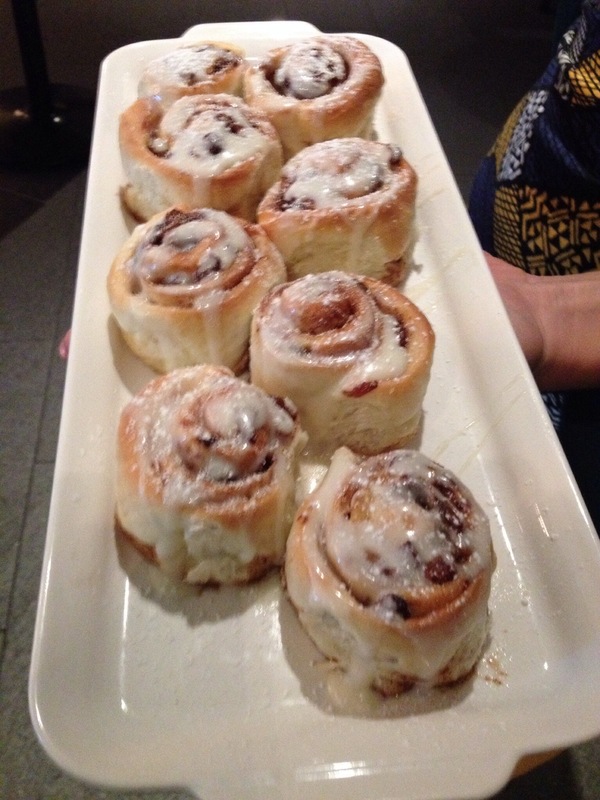 mini cinnamon rolls for all, these little treats are perfectly prepared As they were warm, soft and gooey with the perfect balance of cinnamon, raisins and just the right amount of cream cheese frosting. 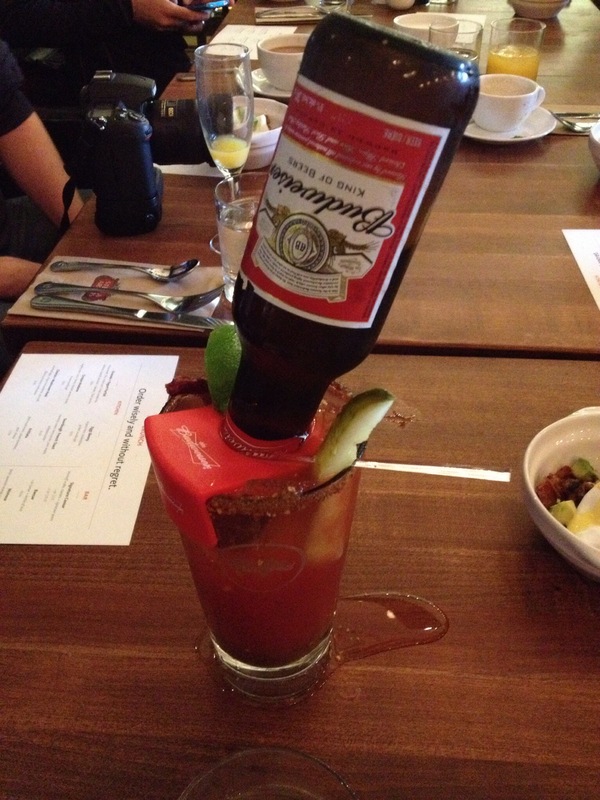 Your next decision will be what great brunch dish to enjoy and wether to pair it with a nice Mimosa $8.75 or a unique play on a Caesar, the Beaser $10.00 – a one ounce Caesar served with a bottle of bud. 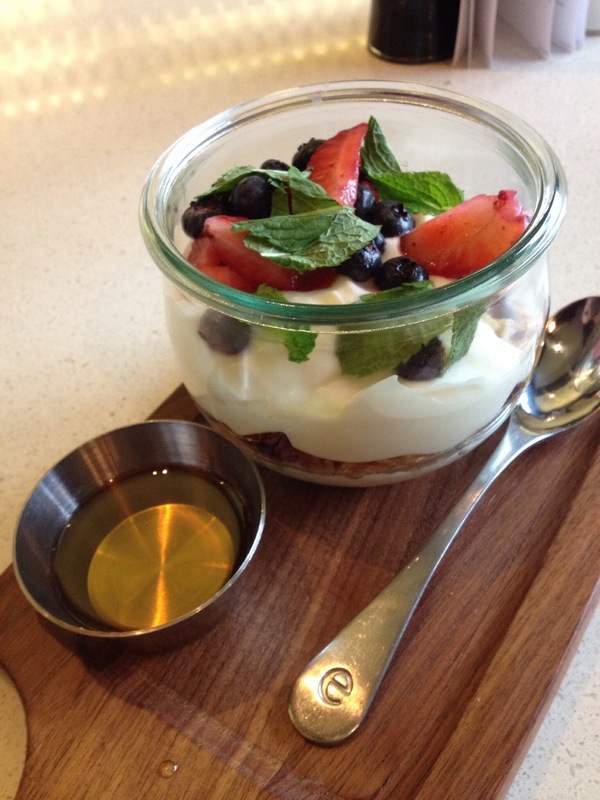 The Granola & Yogurt parfait : $9.00. 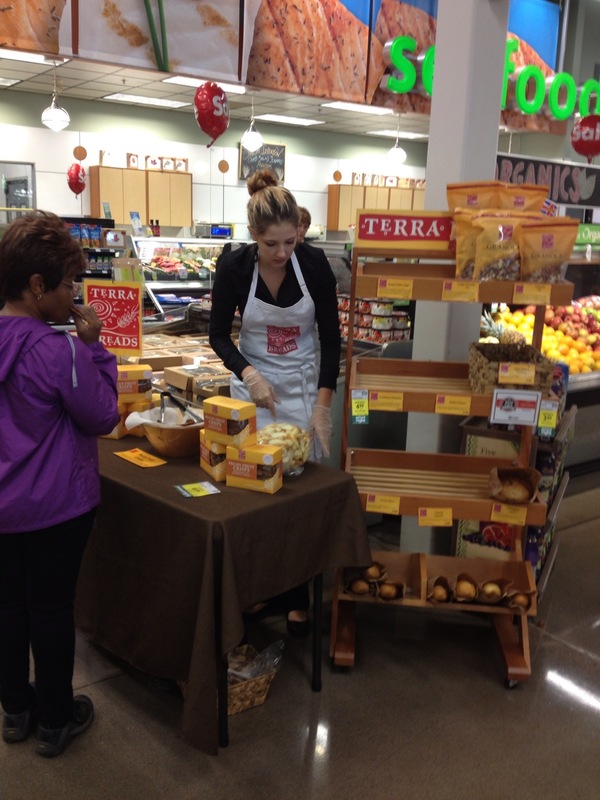 This house made healthy choice is full of flax seeds, rolled oats, dried cranberries, sultanas, toasted almonds and pecans topped with fresh berries. The bonus for me is that Earls uses Greek yogurt and serves the agave drizzle on the side for a perfect balance of natures sweetness to bring this dish together. 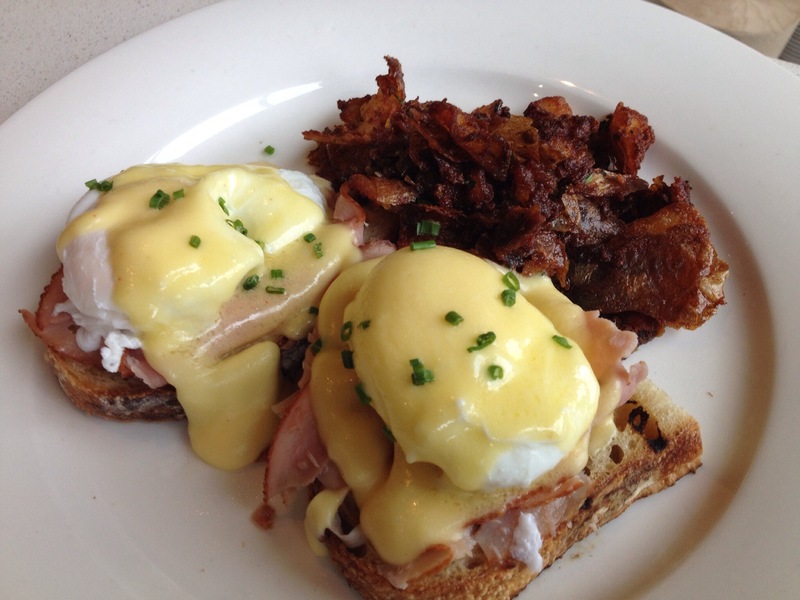 Eggs Benny: $13.00 -This classic is taken to a new level using Earls house made sourdough, Virginia ham, house made hollandaise served on grilled sourdough. The flavours were on the mark, you will be anxious for your next bite! Croque Madame $13.00 – this flavour wow brunch dish is something you may have not tried before as it is not an item found everywhere. It’s similar enough to the Benny but has some unique differences that set it apart. A perfectly poached egg, Virginia ham & Swiss cheese served on Earls house made sourdough bread and served with a roasted Serrano cream, your taste buds will thank you for this one. 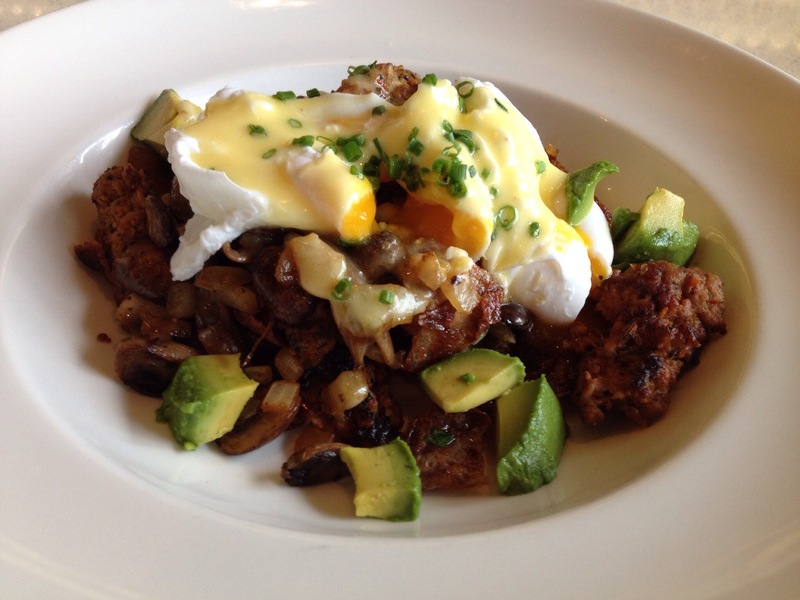 Chorizo & Mushroom Hash: $14.00- Poached eggs served on top of crispy fried potatoes, avocado, fried mushrooms and house made hollandaise. 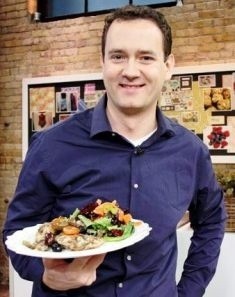 This dish is probably my favourite…it offers a perfect balance of complex flavours and tummy warming notes. 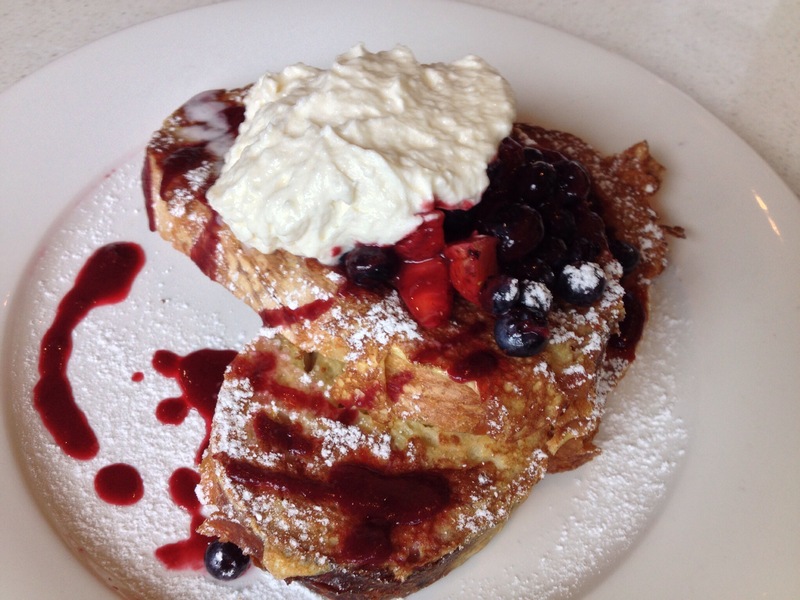 Sourdough French Toast: $12.00 – The sweeter alternative brings French toast to a new level as it is again staring Earls house made sourdough and then topped with delectable chantilly cream, berry purée, pure maple syrup and whipped butter. Frittata $12.00 – Fresh eggs (a play on an Italian style omelet) served with field mushrooms, grape tomatoes and goat cheese to bring it all together. The dish is presented in a iron cast skillet and served with a fresh salad. Earls has introduced a fresh and exciting new brunch menu that offers a new play on some traditional favourites as well as introducing you to some new items…. 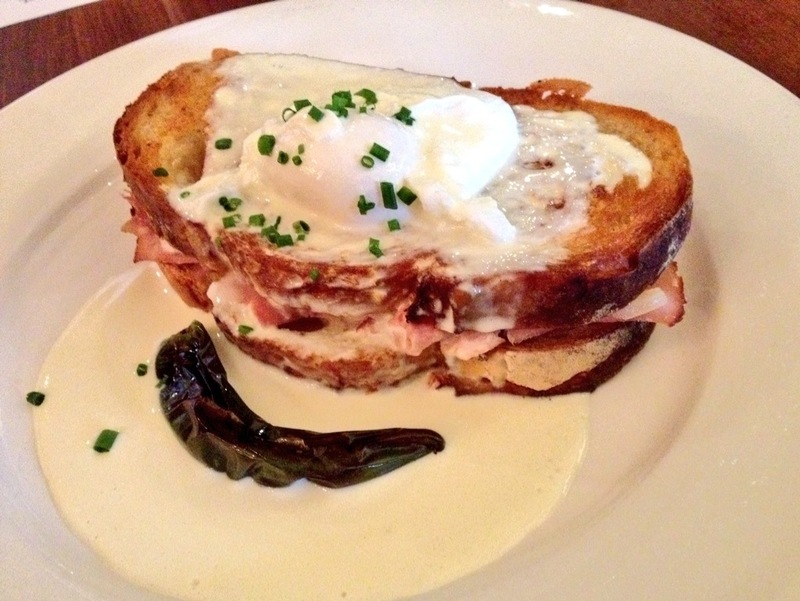 You will quickly understand why Earls house made sourdough shines as a star performer in the brunch dishes. 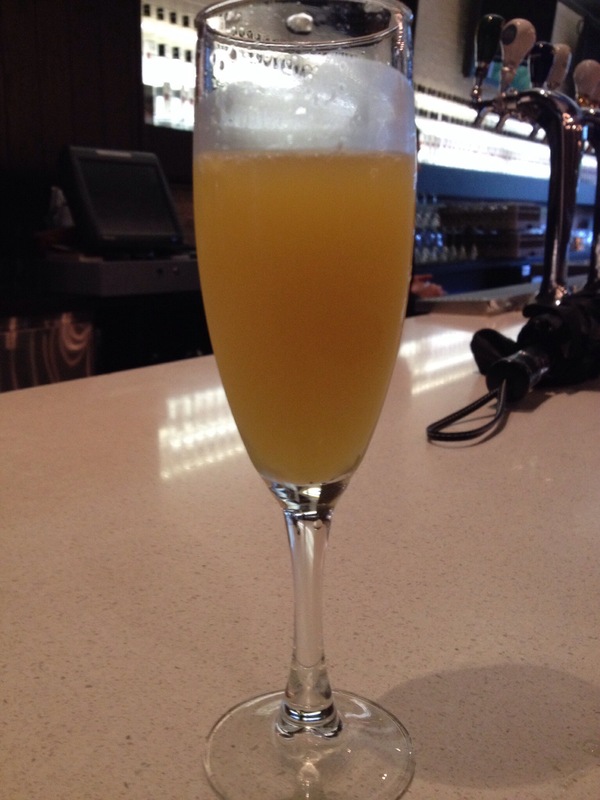 I recommend that you try Earls new brunch… You will surely Meet, eat and repeat! 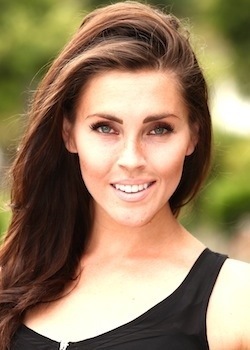 Thank you Foodable Network for this great article and intriguing list of the up and coming top social chefs! Chefs are no longer blurred faces masked behind counters, hidden in kitchens, with only plates of edible artistry to hint at their presence. 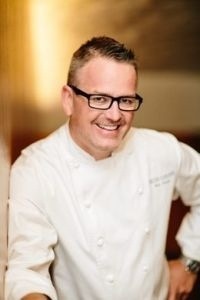 Over the past decade, more chefs have become celebrities, thanks to TV outlets like Bravo’s Top Chef, Food Network’s Next Iron Chef, and a slew of cooking shows hosted by over-the-top personalities like Paula Deen and Rachel Ray. As a byproduct of such entertainment exposure, a greater percentage of the masses – both foodies and non-foodies alike – have become more in-tune to the overall dining experience, from conception to consumption. But forget television: Realistically, most chefs aren’t Food Network celebrities, and the typical life of a chef is far from glamorous. The big shift in today’s chef-consumer relationship lies in the transparency and accessibility of social and digital media channels – namely, Facebook, Twitter, Instagram, and YouTube. 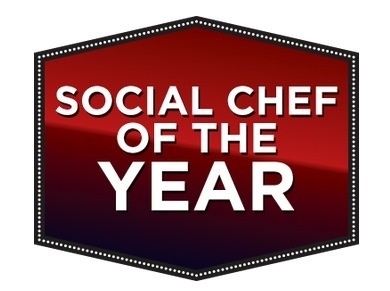 For the first time ever, we present the Top 20 Social Chef of the Year nominees, in no specific order, from our Index of 6,000 chefs throughout 20 of the nation’s most booming food cities. Some are considered cheflebrities for their notoriety, while others are hot emerging chefs to watch out for. Regardless, all had top scores in the three aforementioned elements. Congratulations to those who made the cut! 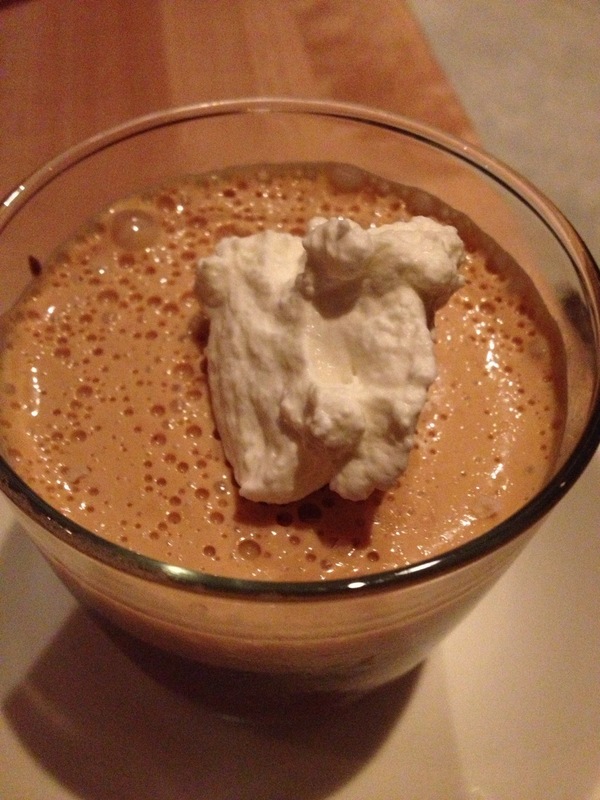 Social platforms can, and will, become the primary vehicle in how emerging chefs reach future and existing consumers. Whether it’s to showcase their culinary style and highlight dishes with the intention of luring guests through the door, highly successful emerging chefs will need to incorporate tactical digital skill sets to their existing culinary talents. 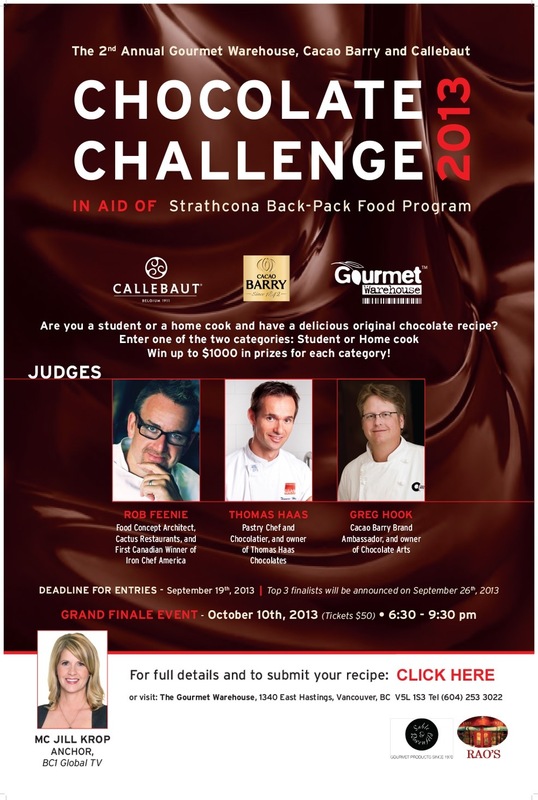 In doing so, chefs will, in a way, become their own media networks. 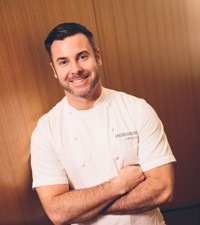 “Once you eliminate the superstars out of the equation and open up to more emerging chefs, you can start drilling down into some very relevant consumer content based on restaurant actions,” said Paul Barron, Founder of DigitalCoCo and the Restaurant Social Media Index. 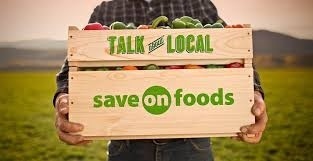 I just had to write a quick blog post on what I think is one of the best new marketing directions that Save on Foods has launched Talk about Local. 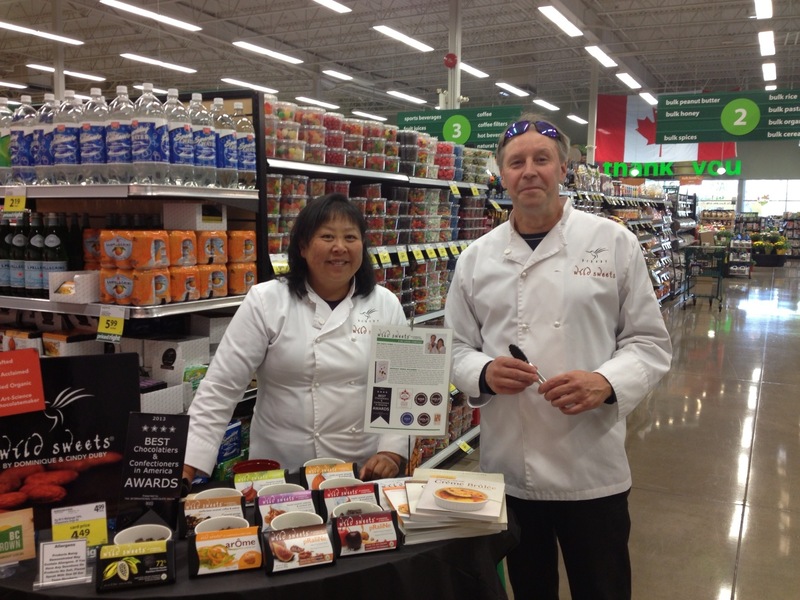 The first day that I walked into Save on Foods and saw the signs and better yet the products featured throughout the store I was encouraged that Save on is listening to their customers and has their finger on the pulse of changing trends……. Have you noticed how many wonderful farmers markets are around now? 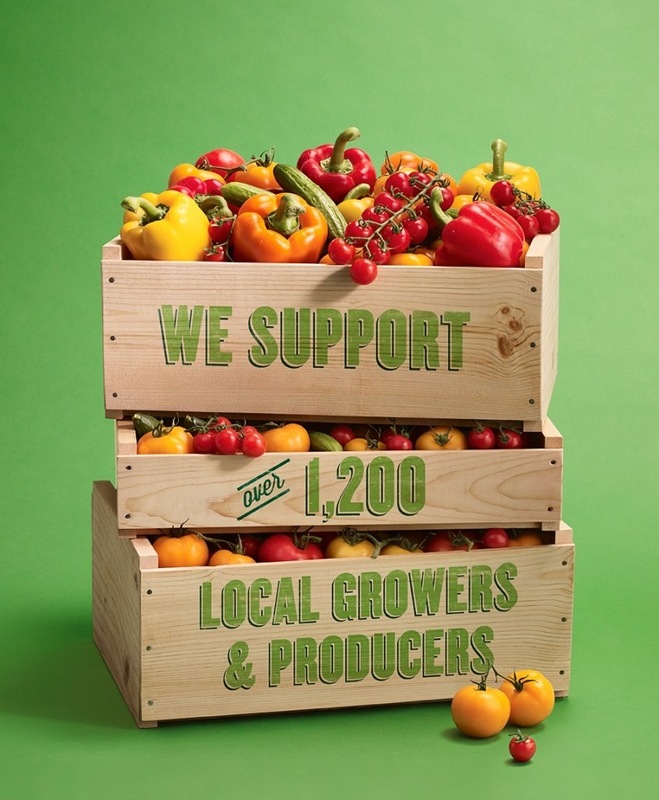 The fact is there is nearly 10+ farmers markets within the greater metro Vancouver area showcasing local producers fresh and fantastic products every weekend. How wonderful is it to find a connection to understanding where your foods and products actually come from? Even better how wonderful is it to actually meet the farmer, chocolatier, baker or artists that is bringing the products to you?! 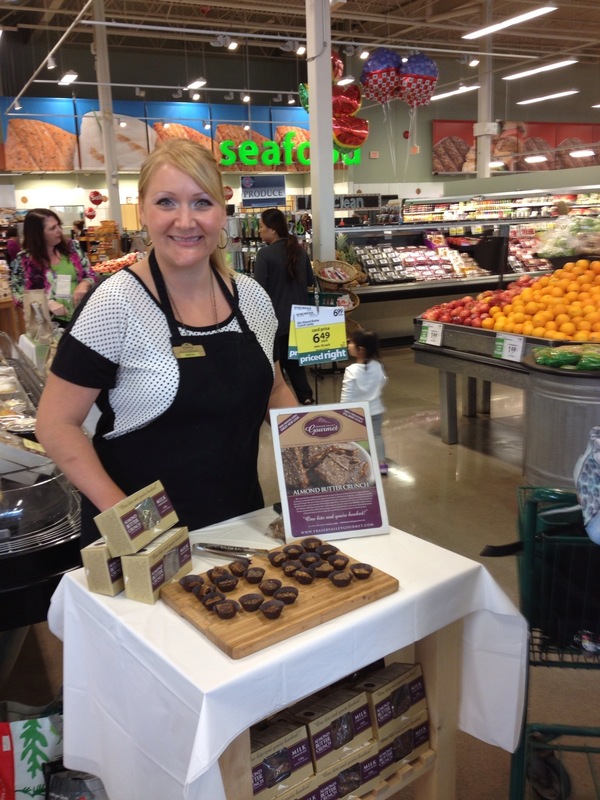 Great local / award winning hand crafted chocolate! 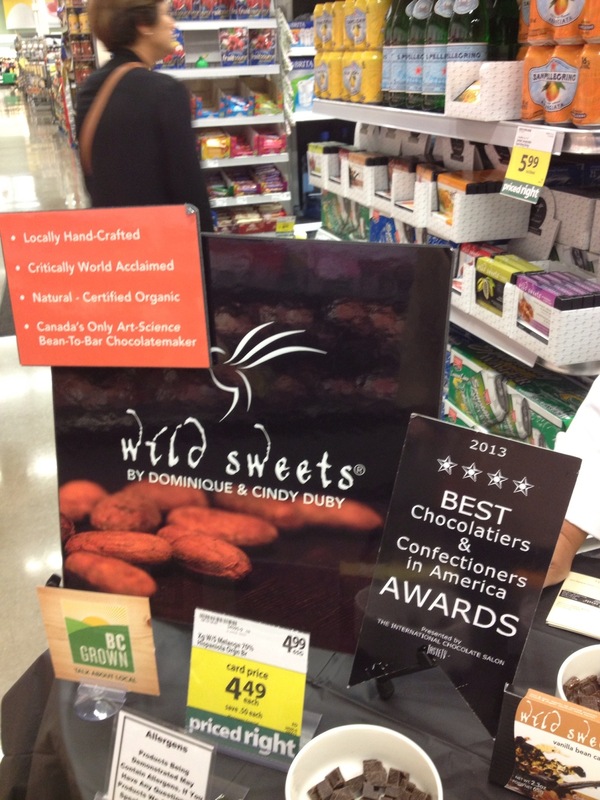 From Wild Sweets – tasting actually served by award winning Chocolatier Dominique and Cindy Duby! 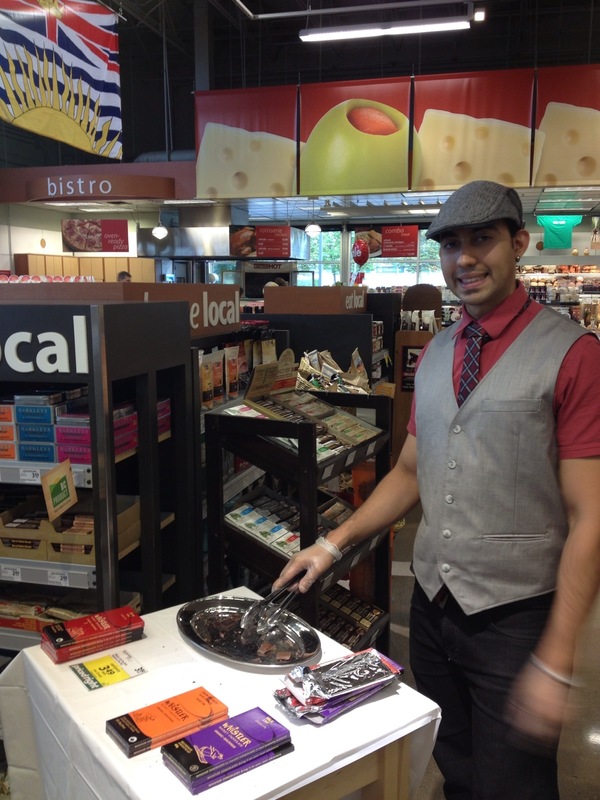 The local producers have been great in explaining their process, product and educating us as to our choices! 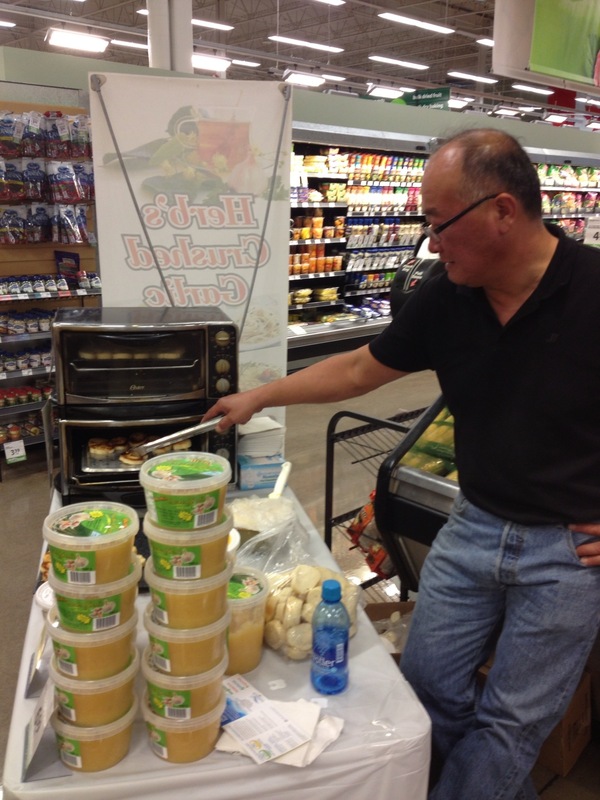 Herb’s Crushed Garlic…. 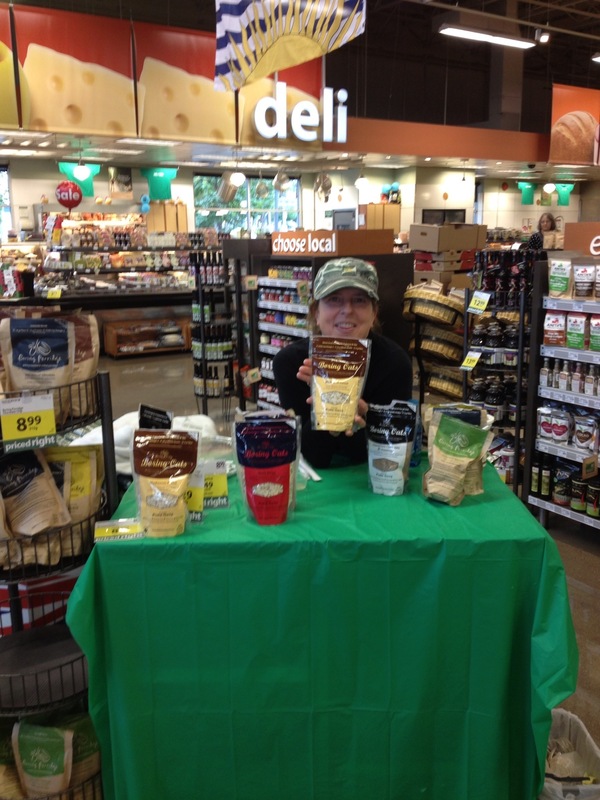 The aroma pulled me to this tasting ….wow! 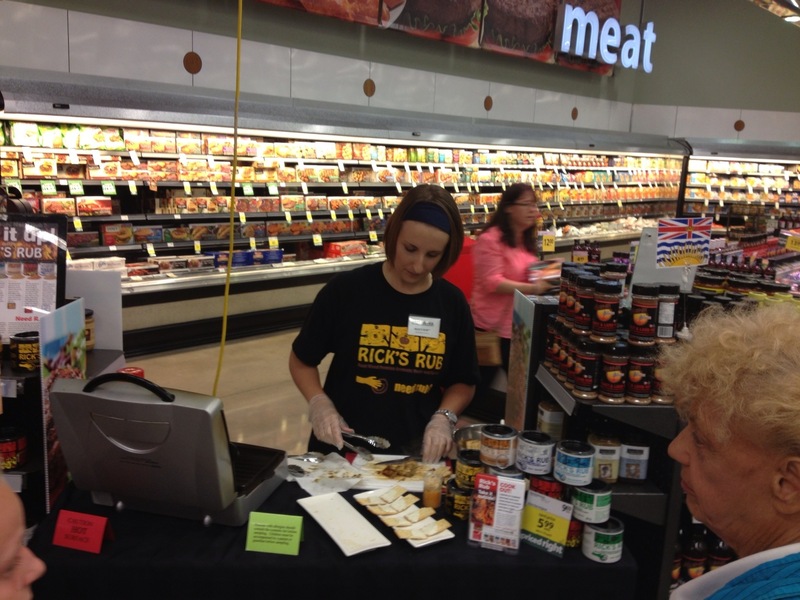 There are far more products than I can put into one posting but I wanted to make sure that you all knew that the options and availability of local products is expanding in multiple locations of Save on Foods…. This has to be good news for all of us! Thank you Save on Foods for embracing this trend! We happened to bump into this great little spot after a Whitecaps game and though it was busy we were able to get a cosy little table within about 10 mins. We were greeted with a smile and a great waitress that knew her menu inside and out that guided us to the perfect delectable treats! 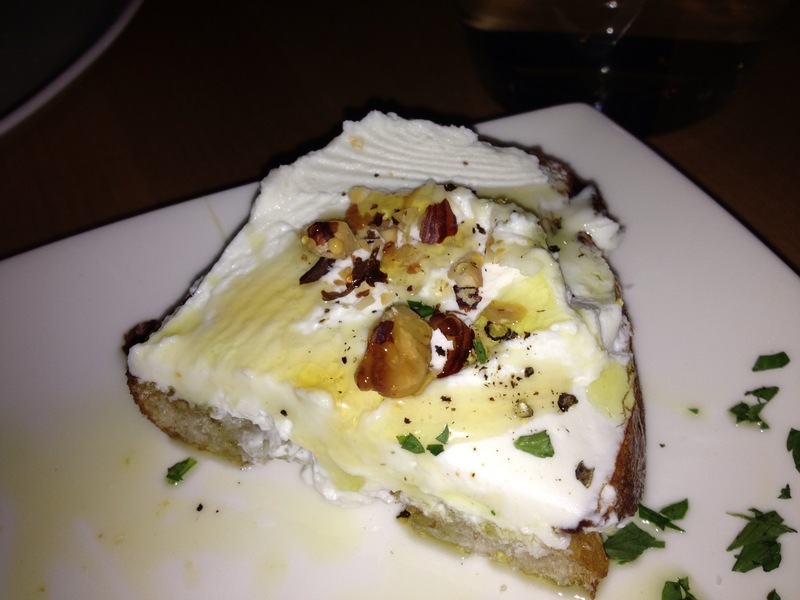 Whipped Ricotta Crostini – with honey, black pepper and toasted hazelnuts. 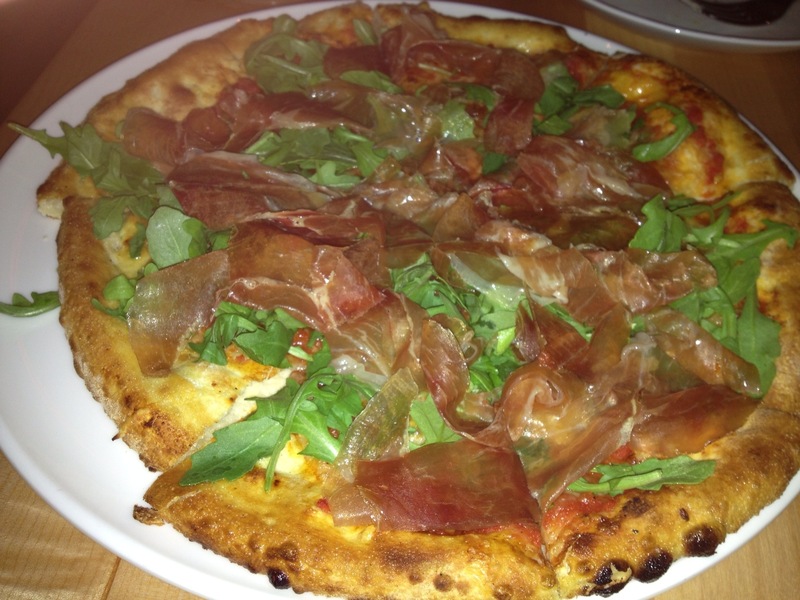 What a perfect balance of great subtle but distinct flavors…..
Prosciutto pizza topped with arugula and roasted garlic. Another excellent blend of a perfectly cooked pizza with wow flavors… The garlic was tasty and creamy without being overwhelming…. They have a moderate but good wine list and it is very reasonably priced…. 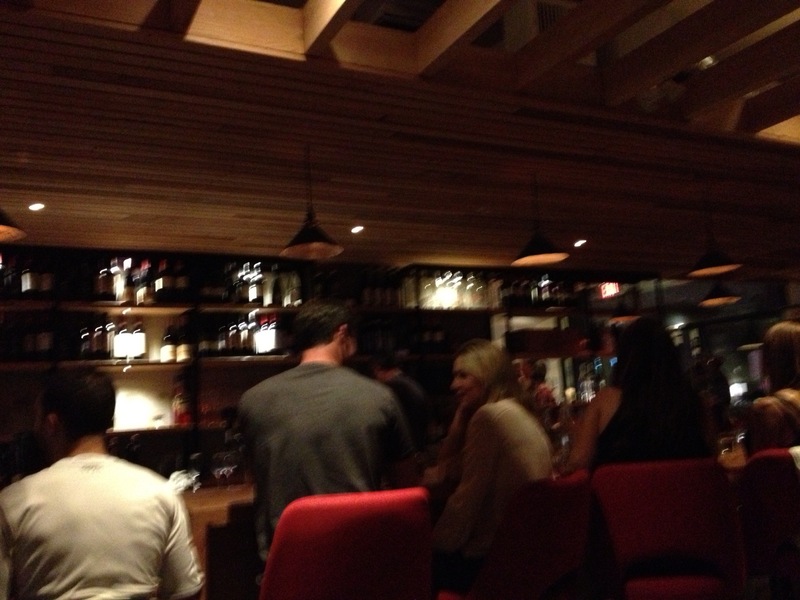 They also have a nice handful of “house made” pastas that we heard rave reviews about from neighboring tables…. Last, because we split everything we were happy that we left room for dessert. It was a “must have again” type of dessert to be sure. I give the nook a thumbs up and recommend that you go to Nook whether its for a nice quiet dinner with your significant other or with friends….. You will find yourself happy, comfortable and enjoying the night.